Lepidolite comes as a purple to pink (color meanings) toned mineral stone that bears many characteristically plate-like layers of shiny and grainy mass. It lies abundant in Africa, Brazil, Czech Republic, Dominican Republic, Madagascar and the United States. Its subtle coloring draws more qualities that go beyond aesthetics in encouraging better health and overall well-being. Its interesting metaphysical or chakra qualities make it a potent agent for balancing emotional extremes as it is helpful in establishing a stable emotional center for its bearer. In many ways, it helps create a serene and healthy dwelling place for the body and soul. The mineral typically acquires a monoclinic crystal system as it forms in cleavable masses of scaly aggregates and tabular hexagonal crystals. Commonly associated with lithium bearing minerals like tourmaline, this mineral is also used in absorbing many forms of emanations, which can damage health. Its amplified mica (found in mineral makeup) qualities basically enable it to work well in mopping out electromagnetic pollution such as those absorbed when using computers for extended periods of time. In dissipating such negative energies, it opens up the crown chakra as well as the third eye, making it a potent agent in tuning out thoughts and in building up positive energies right into the core of the body. Hence, lepidolite is tagged as a serenity stone as it washes away many forms of hostilities that can create an imbalance to the harmony in the mind and body. 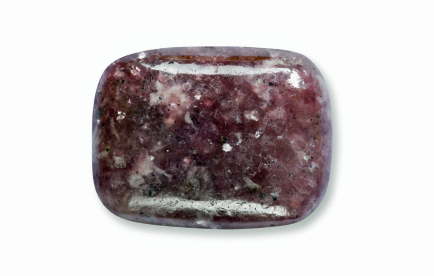 Lepidolite promotes harmony not only in one's thought but also in one's opportunities. It basically allows one to give patient attention to his qualities, willing him to see good and beauty in all the he has. In this light, the mineral is helpful in building resistance to the negativity brought by depression, anxiety, self-consciousness or grief. Instead, it wills the mind of its optimism to help people get the confidence and reassurance they needed to make things happen and succeed in life. Amidst the tarnished surroundings, the mineral calms the mind by releasing an expansive auric field that can reverse the effects of stress, worry, fear or even traumatic encounters. As a cardinal 'stop and smell the roses' stone, it appeals to the egoic mind and replaces all uncertain thoughts with courage and pride. In facing various crises in life, this stone aids in allowing people to recognize their roles instead of constantly feeling like a victim of life. Disorders like addiction, bipolar, insomnia and depression have severely affected people's quality of life. In this sense, the relaxing and optimistic qualities of mineral lepidolite relieve despondency by filtering out extraneous distractions. By allowing one's thought to focus on more important things, it rules out emotional stresses to initiate emotional as well as physical healing. To enjoy the helpful benefits of lepidolite, place it over the site of disease or disturbance. For instance, put it under your pillows to bring relief to sleep disorders. Here, you can feel the stone gently vibrating. In enhancing the regeneration of negative ions, it helps strengthen immune functions and initiates effective detox mechanisms. You may also enjoy lepidolite as a luxurious healing and soothing bath.